ProVen Probiotics Lactobacillus & Bifidus may help maintain intestinal and immune health during pregnancy. Bifidobacterium bifidum (CUL-20), Bifidobacterium animalis subsp. lactis (CUL-34), Lactobacillus salivarius (CUL-61), Lactobacillus paracasei (CUL-08) - Containing 10 billion viable cells. Calcium Carbonate, Potato Maltodextrin, Vegetarian Capsule Shell (Hydroxypropyl Methyl Cellulose, Colour (Titanium Dioxide)), Ascorbic Acid, Microorganisms (Lactobacillus salivarius CUL61, Bifidobacterium animalis subsp. lactis CUL34, Bifidobacterium bifidum CUL20, Lactobacillus paracasei CUL08), Corn Starch, Anti-caking Agent (Magnesium Stearate). As a food supplement take 1 capsule per day with food during pregnancy and while breast feeding. Below are reviews of ProVen Probiotics Lactobacillus & Bifidus for Pregnancy - 30 Capsules by bodykind customers. If you have tried this product we'd love to hear what you think so please leave a review. 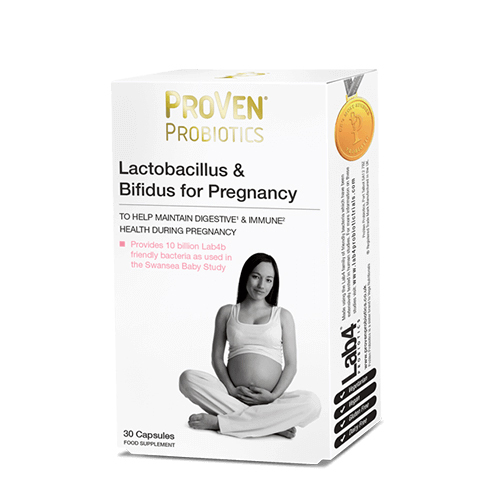 ProVen Probiotics Lactobacillus & Bifidus may help maintain intestinal and immune health during pregnancy. Healthy bacteria are just as important to the new born baby as to adults.